2018 has been a mixed year for investors; likely some spectacular gains and some spectacular losses. The economic landscape has been complex: geopolitical and trade uncertainty, changing Prime Ministers, Royal Commission revelations and the cryptocurrency bubble looks to have burst. These have all had significant impacts on the local sharemarket. Following several years of steady growth, we have seen volatility increasing and a more bearish sentiment beginning to creep into global markets. At the time of writing, many of the developed world’s largest indices (The Dow Jones Industrial Average, the FTSE 100 and the ASX 200) had given up any gains produced in early 2018. Looking forward, 2019 is likely to be characterised by further volatility and a difficult environment for shares. Data from Investment Trends (1) shows Australian share market return expectations have turned negative for the first time since the Global Financial Crisis. 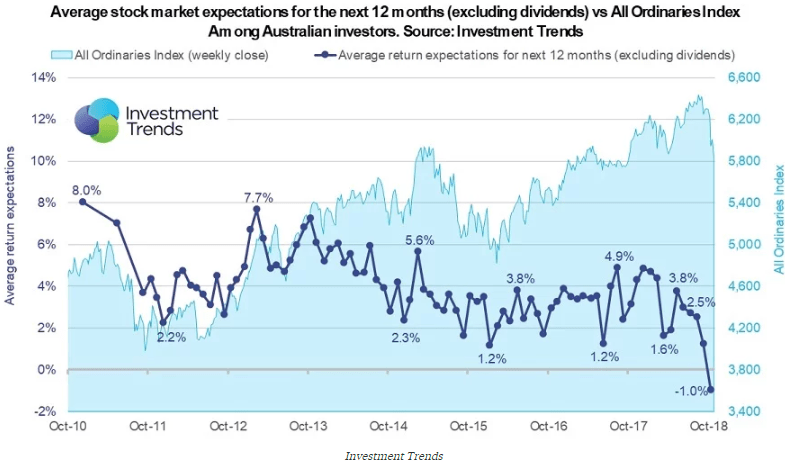 In line with market performance, retail investors in Australia are now expecting a return of -1% in 2019, a sharp drop from January, where sentiment was +4.7%. So, with many indicators pointing to a potential downturn in 2019 in developed markets, now is the ideal time for investors to position their portfolios for a lower growth environment and focus on alternative markets, as well as stable cashflow-producing investments. From a global perspective, China’s market could present some opportunities in 2019, with its cycle diametrically opposite to the US equity cycle. While US earnings growth and margins appear to be peaking, China’s share market looks to be close to a bottom and could therefore be worth considering for investors seeking global exposure. We also like Japan as a turnaround story. On a macro level, the long period of deflation looks to have come to an end, productivity is improving and from a fundamental viewpoint, improved returns on equity are on offer for investors. Individual stock picking in foreign markets can be difficult, so for investors a simple option to gain broad market exposure can be via ETFs or mFunds. Our ETF Filter and mFund Filter can help sort through the array of options by asset class, sector, issuer and fees. Looking closer to home, Australia’s retail sector is already weak and there are indicators showing it’s unlikely to improve any time soon, with lower motor vehicle sales growth, falling house prices and money supply growth at a 26-year low. With State and Federal elections slated over the next six months, investors will need to keep a close eye on consumer confidence, which tends to be timid ahead of major elections. Falling consumer confidence, tighter lending standards and the Reserve Bank of Australia’s reluctance to cut interest rates further, mean we are also likely to see house prices continue to fall nationally in 2019. Investors may therefore wish to consider remaining underweight housing stocks and banks. The 2018 drought across Australia has seen many agricultural stocks fall. While a rebound in crop volumes is not likely to hit until 2020, 2019 will be the year to pick up some agricultural stocks at the bottom of the cycle. In times of volatility, other defensive sectors to consider are telecoms, utilities, healthcare and staples. To conclude, investors may be in for a bumpier ride in 2019. However, those with well-positioned portfolios should still be able to capitalise on some attractive income and growth opportunities. Happy investing and here’s to a healthy and prosperous New Year.